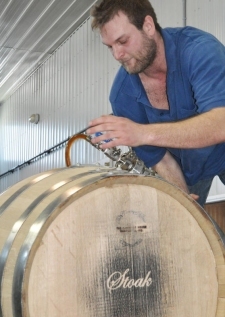 PICTON, ON – A casual conversation between brewmaster Alex Nichols of Barley Days Brewery and cooper Pete Bradford of The Carriage House Cooperage has led to the creation of a unique new barrel-aged beer. Last Thursday, Nichols (pictured) filled a 225 litre American oak barrel from the Carriage House with Barley Days Sugar Shack Ale, a beer made with maple syrup, and also included an extra dose of syrup from Fosterholm Farms. The barrel was steamed previous to use, which Nichol’s hopes will cause the oak to add a more subtle flavouring to the beer. It’s expected that the beer will be ready for bottling in mid-March, at which point it will be offered for sale at the brewery store.